Qantas has unveiled its new engineering facility at Los Angeles International Airport, an investment of more than US$30 million. It is one of the largest commercial hangars in North America and the first specifically designed to accommodate the Airbus A380. 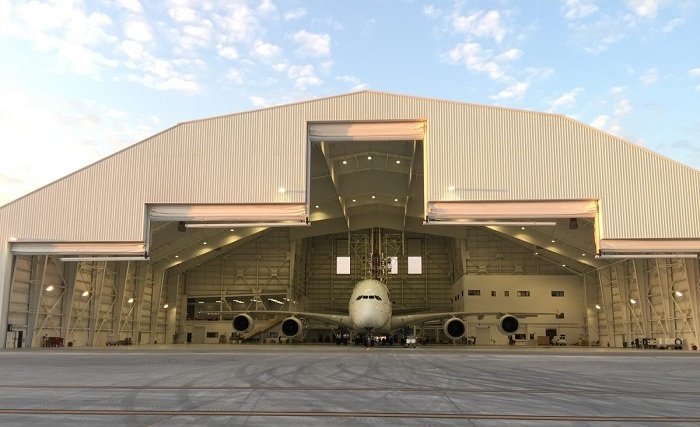 The 5.7 hectare hangar will be used to carry out maintenance checks on Qantas’ A380 and Boeing 747 aircraft during ground time in Los Angeles. It will also have capacity to support Qantas’ new B787-9 Dreamliner when it enters service in late 2017. The new building has enabled Qantas to consolidate its property footprint in LA, with 40 corporate employees moving into new offices in the hangar and joining the team of local engineers. Qantas’ previous hangar at LAX was built at the start of the jet era in 1958. It was demolished to make way for broader improvements to the airport, triggering the construction of the new facility.